Located just southwest of Houston in Missouri City, Troop 103 offers a Dynamic, Relevant, and Fun scouting experience. Founded over 25 years ago, Troop 103 is chartered by First United Methodist Church in Missouri City, Texas and is a unit in the Thunder Wolf District of the Sam Houston Area Council. Our troop consists of four patrols with scouts arranged by rank and age. We have about 50 scouts and just over 30 volunteer adult leaders. We camp monthly at locations all around southeast Texas. Troop 103 offers a dynamic program of exciting adventure, citizenship, and service. Led by the Senior Patrol Leader and his council of Patrol Leaders the troop's year is planned out in late Summer and includes monthly camping events, several service days, advancement-focused activities, and events to recognize achievement. 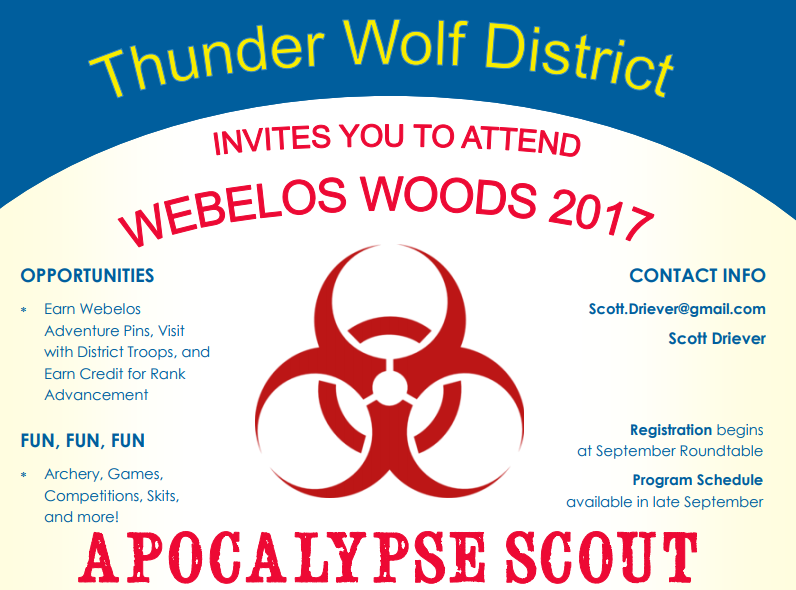 The troop's camping year often includes canoeing, backpacking, trailer camping, and participation in District Camporee and Webelos Woods. During camping weekends and troop meetings scouts learn skills such as orienteering, water safety, rifle shooting, cooking, food safety, first aid, fire safety, hiking, and backpacking. Any Scouting program has to be attractive to today's youth. In Troop 103 scouts learn to try new things by trying their hand at any of over 130 merit badges by working with trained merit badge counselors within the troop, within the community, at camps, and at special events throughout the year. Topics are plentiful and range from Game Design to Fly-Fishing and Entrepreneurship. By mastering new skills on their journey through the ranks and working as a member of a team in their patrol scouts build self-confidence, responsibility, and high self-esteem from their achievements. Scouts At troop 103 our program is designed by the scouts for the scouts and each year that program includes activities that provide service to others in the community through food drives, beautification projects, service to the congregation of the church that charters the troop, and participation in the various Eagle-rank projects that troop members are working on. Our youth leaders attend the Boy Scouts of America's National Youth Leadership Training (NYLT) to equip them with the leadership skills and attitude to lead a fun program that appeals to scouting age boys. All scouts in positions of responsibility in Troop 103 are trained for their position by the troop leadership. Before every program year the troop gathers together for an all night meeting where the the youth leadership leads the troop in deciding what activities Troop 103 will be doing that year, getting input from the membership to make determinations on which activities most appeal to the troop. After each monthly camping event the Senior Patrol Leader holds a Patrol Leader's Council to review the most recent outing and plan the details of the upcoming month's meetings, making adjustments from the annual program plan as needed. Troop 103 is all about action. Whether it is service to our community, enjoying the great outdoors at a troop campout, attending district events, or participating in council or national events, our troop can probably be found there. Check out the sections below to see what we've been up to. Troop 103 welcomed many Arrow of Light scouts on this fun weekend campout in November at Camp Mauritz. Scouts taught the Fix It adventure using their battle tested teaching board where the Webelos fixed fuses, plumbing issues, air vents, and other household maintenance items. The troop participated in the cook off, camp site inspection, and mustered their scout spirit. The hard work paid off and 103 came home with the coveted camp site inspection award this year. The troop did some intro level canoeing and worked on advancement while enjoying a great weekend camping trip at the Tellepsen boy scout area of the windy "Blow-vay" scout ranch in Navasota, TX. Bovay has a great new canoe dock! Every year the troop gets together in August to plan our their program year. We start in a meeting room and scouts bring their ideas of adventures they would like to do and where they would like to do them. After the hard work of planning is done lots of pizza arrives and the boys feast on pizza and snacks in the recreation room in the church. Those that would like to stay the night are welcome to do so under adult leader supervision, others make it a 'late night' to enjoy some of the fun before heading home. Summer time is a busy time for the scouts and leaders at Troop 103. We explored the great outdoors this summer at the following places. The troop sent two crews of scouts and leaders to Philmont Scout Ranch in Cimmaron, New Mexico this year where they hiked and explored the mountains and camps of this BSA National High Adventure Base. The troop sent a crew of scouts and leaders to Northern Tier in the boundary waters of the US and Canada this year where they canoed and explored the waters and swamps of this BSA National High Adventure Base. The troop sent over 25 scouts and 8 leaders 9000 feet above sea level to Camp Alexander in Colorado near Pike's Peak. The scouts enjoyed cool summer weather while they worked on merit badges and received training on scout skills up to first class. The end of the week saw many of our scouts and scouters take part in the white water rafting adventure and other scouts tried their skills at rifle shooting, shotgun shooting, archery, fishing, and rappelling down "the Rock!". 103 regularly sends adults and youth to help staff our district cub scout day camp. Scouts gain valuable leadership experience and adults get to have a lot of fun in various leadership roles. Usually you can find 103 serving as staff and junior staff on the BB gun range, archery range, games areas, helping with facility services like water delivery as well as help setting up the event and packing it up when it is over. Service to the cub scouts is an important part of keeping the troop growing. This summer the troop continued its tradition of growing youth leaders by sending scouts to the council's National Youth Leadership Training (NYLT) course at Tellepsen Boy Scout Camp at Bovay Scout Ranch in Navasota, TX. NYLT is a six-day course. Content is delivered in a troop and patrol outdoor setting with an emphasis on immediate application of learning in a fun environment. Interconnecting concepts and work processes are introduced early, built upon, and aided by the use of memory aids, which allows participants to understand and employ the leadership skills much faster. Troop 103 invites our scout parents and siblings out for a weekend campout once a year to see their scouts in action doing what scouts do best - camping. This year we had some beautiful weather at Bay Area Council's Camp Karankawa. In a gigantic grassy field with a couple of big trees for shade we relaxed and cooked up some great meals. Scouts worked on advancement and generally took it easy. In March a crew spent their Spring Break on a sailboat in the Florida Keys living aboard and snorkeling the nearby reefs. Scouts got to sail the boat, work the anchor, cook all our meals, and in general be the crew for a week. NOTE: THE INFORMATION PRESENTED HERE IS NOT AN OFFICIAL DOCUMENT OF THE BOY SCOUTS OF AMERICA, BUT IS SOLELY THE WORK AND RESPONSIBILITY OF TROOP 103 AND THE WEBMASTER WHO CAN BE REACHED AT WEBMASTER@TROOP103.COM. CONTACT THE SAM HOUSTON AREA COUNCIL (WWW.SAMHOUSTONBSA.ORG) FOR OFFICIAL COMMUNICATIONS OF THE BOY SCOUTS OF AMERICA.